ABOVE: The Great Wolf Lodge resort in Bloomington, MN, near the Mall of America features the new animatronic Northwoods Friends theater as designed and commissioned by LA ProPoint. Immersive entertainment experiences are now appearing in spaces that were previously not considered in venue design. Take, for example, the lobby at multiple locations of Great Wolf Lodge resorts. To add yet another focal point of fun for guests, many Great Wolf Lodge lobby areas now include high-tech theaters with automated on-screen components and animatronic character elements choreographed together with animated cartoon programming. This is the latest example of how Great Wolf Lodge makes extra efforts to extend entertaining activities into every corner of the company’s facilities. The nationally known chain of indoor waterparks offers countless kid-friendly activities, including the main event water slides and attractions. To successfully implement the new lobby theaters, a substantial amount of automation and networking technology needed to be installed within a limited footprint. The entertainment engineering experts at LA ProPoint handled design and installation of the project. Based in Sun Valley, Calif., LA ProPoint specializes in a wide range of products and services for entertainment and AV installations across North America. The company tackles all kinds of projects from automated stage machinery to stage rigging, R&D and prototyping services for clients. High-profile LA ProPoint clients include theme park and theatrical powerhouses, from Disney and Cirque du Soleil, to major sporting venues such as AT&T Stadium (home of the Dallas Cowboys), and even museums such as California Science Center. 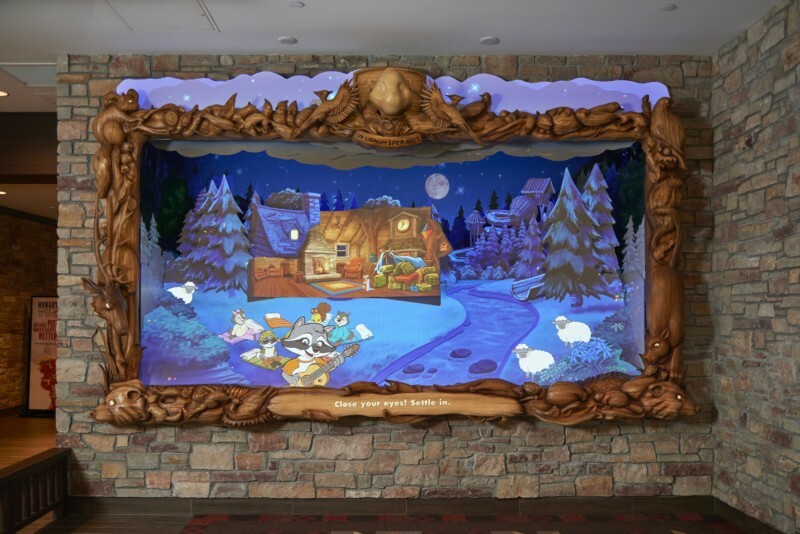 LA ProPoint utilized PC-based control technology to balance AV and animatronic functions in the Great Wolf Lodge lobby installations in a cost-effective manner. To start, Great Wolf Lodge commissioned four installations in 2017 with the option to add more in 2018. Because the technical demands for the Great Wolf Lodge animatronic show were complex, LA ProPoint had to leverage expertise developed from a wide range of applications to meet the performance specifications. The new animatronic show is based on the Great Wolf Lodge characters, a merry crew of singing and dancing woodland creatures. The Northwoods Friends lobby show is divided up into multiple sequences with two main acts and an intermission segment, which acts as a screen saver of sorts. The Northwoods Friends animatronic theater implemented by LA ProPoint is fully automated by a Beckhoff PC-based control platform. One CP6706 Panel PC with 1.46 GHz Intel® Atom™ processor running TwinCAT 3 software automates the Northwoods Friends theater. TwinCAT handles the control for all aspects of the theater, including the stepper motor-driven animatronic elements and all the AV equipment. A variety of TwinCAT 3 software packages are used in the lobby installations at Great Wolf Lodge, including the PLC/NC and PTP libraries for control, PLC HMI for visualization and the TCP/ IP communication library. All TwinCAT 3 programming was written using Structured Text (ST). Using Ethernet TCP/IP, the Beckhoff control system connects to three different projectors from two different manufacturers, a Blu-ray player, a high-end sound mixer and three BrightSign media players. “The most important aspect backing our decision to use TwinCAT is the ability to program everything in one universal software platform,” Adams said. To establish communication specific to AV and entertainment applications, TwinCAT SMPTE timecode interface can extract timing information sent by a SMPTE master in order to provide an absolute time reference for media metadata in the application. “The Society of Motion Picture and Television Engineers defined the SMPTE timecode interface for audio and video synchronization, so it says a great deal about the suitability of TwinCAT in entertainment applications. This is significant from a controls engineering perspective because traditional PLC platforms just don’t go there,” Adams added. The Beckhoff system connects to the reception desk at Great Wolf Lodge via the CP-Link 4 one cable connection technology to a compact CP2907 Control Panel with 7-inch display. “Using CP-Link 4, we only had to run a single Cat 6 cable to provide power and data from the control room to the front desk,” Adams explained. The intuitive HMI developed in TwinCAT by LA ProPoint offers easy operation for all resort staff – from front desk personnel to AV and maintenance staff. LA ProPoint implemented EtherCAT industrial Ethernet for communication with the peripheral devices behind the scenes of the Great Wolf Lodge theater. For example, LA ProPoint uses a Beckhoff EL3702 EtherCAT oversampling terminal that “listens” to the analog signals broadcast from an SMPTE master to slave devices. Additional EtherCAT I/O terminals handle digital and analog data acquisition, and directly connect with stepper motors for compact motion control. “Another key deciding element to use EtherCAT Terminals was how simple the I/O interface is for motor control and drive technology,” Adams said. “The EL7041 stepper terminal was very easy to connect with the stepper motors for control. Instead of programming, mounting and wiring eight different motor controllers, everything is programmed centrally in TwinCAT and motors are cleanly wired back to DIN rail-mounted I/O.” The pulse-wide modulation (PWM) output stages in the EL7041 cover a wide range of voltages and currents. The terminal can be adjusted to the motor and application by changing just a few parameters, and 64-fold micro-stepping ensures quiet and precise motor operation in the application. Part of the animatronic theater frame lowers, and a moving screen component showing a ladder rises as a Northwoods Friends action sequence plays out.